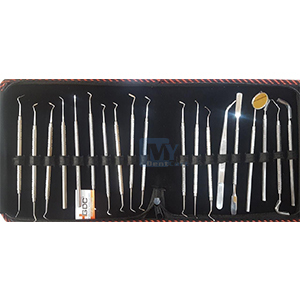 It is a set of 19 conservative instruments that are ideal to be used for various purposes like examination, restoration, manipulation of tissues, removing teeth and operating other surrounded oral regions. The Dental Instruments are made using advanced technology and keeping in mind the safety and preciseness of the various dental treatments. Dental Instruments we manufacture is made available in different sizes to suit the precise requirements of the clients.